On January 8, 2013, in a major policy address on how to address Virginia’s urgent transportation funding needs, Governor Bob McDonnell proposed to end Virginia’s state tax on gas and replace it with a higher rate for the state sales tax. Along with higher vehicle registration fees, a new special charge on fuel efficient vehicles, and a shift in general state funds away from other uses (primarily education, health, and public safety), the governor’s proposal would provide for an additional $3.2 billion over five years for transportation investments. Virginia certainly desperately needs to fund higher investment in roads and highways. Virginia has chronically underfunded such investments for years, leading to over-crowded and poorly maintained roads, especially in Northern Virginia. But the governor surprised many on how to provide the needed funds. Instead of increasing the tax on fuels for cars and trucks (the traditional primary source of funds for roads and highways) to make up at least partially for what has been lost to inflation over the years, he instead called for getting rid of the gasoline tax altogether. Instead of drivers paying through a fuel tax for the building and maintenance of the roads they use, he would shift the burden onto the state sales tax. Everyone has to pay this, drivers and non-drivers alike. Indeed, if the governor’s proposals were to be adopted, the one product people commonly buy that would not be subject either to the sales tax or an excise tax would be gasoline! This is stupendously bad policy. A basic principle of economics is that for efficiency, those who benefit from some good or service should pay what it costs to the extent this is possible. Fuel taxes, when they are set at a rate to cover what one needs to invest in road construction and for maintenance, approximates this fairly well. Those who drive more and hence burn more fuel, pay more. Those who drive heavy vehicles, which disproportionately account for road deterioration, also pay more as their heavier vehicles burn more fuel. The relationship is not perfect, but is much better than dropping any link whatsoever, as the governor proposes. The fuel tax also acts as an incentive to buy vehicles with greater fuel efficiency (a national objective) and to drive less (and hence reduce pollution and congestion). Virginia currently imposes a fuel tax of 17.5 cents per gallon for gasoline as well as diesel. This rate has not changed since 1986 (taking effect in 1987). The governor correctly points out that since it has not since been adjusted to reflect inflation, the 17.5 cents received today can buy only about 8 cents of what it could in 1986. He also complains that since vehicles have become more fuel efficient, and since there are a small but growing number using alternative fuels such as ethanol, natural gas, and electricity, the state is receiving less through the fuel tax per mile driven than before. These statements are true. But there are obvious ways to address them instead of ending the gasoline tax altogether. First, it is easy to index the fuel tax for inflation. Every January 1 (or whatever anniversary date one wants to use) you adjust the rate to reflect inflation over the past year. The adjustments each year would be small, but accumulate over time. With inflation currently running about 2% a year, a 17.5 cents per gallon fuel tax would rise to 17.85 cents, an increase of 0.35 cents – only about a third of a penny on gas that now costs $3 to $4 per gallon. Second, one could charge similar taxes on vehicles powered by alternative fuels. One could easily charge the same fuel tax rate for ethanol (just as one now charges the same 17.5 cents for both gasoline and diesel). And one could work out the equivalent for natural gas and other fuels which are sold or will be sold at the equivalent of the pump for gasoline. For electric power charging batteries it would be only slightly trickier. Since one would normally charge the batteries at home from your household electricity supply, there is not the equivalent of a pump as the point where one could impose a tax to cover the costs of roads and highways. But cars are inspected annually in Virginia. At these annual inspections, one can check the mileage, see how many miles were driven in the past year, and then charge accordingly. The amounts are not huge. According to figures from the Federal Highway Administration, we on average drive 13,476 miles per year in the US, and the Energy Information Agency reports that the average fuel economy is 23.5 miles per gallon (as of 2010, the same as in 2009). Dividing this out, the average driver burns 573 gallons per year, and with a tax at 17.5 cents per gallon, pays $100 in fuel taxes ($100.4 to be precise). If the fuel tax were doubled to 35 cents, one would pay $200. Such an amount (less if one has driven less, and more if one has driven more) could easily be charged at the time of the annual inspection. And for plug-in hybrid vehicles, burning gas sometimes and using a battery charged at home other times, one could obtain a refund on your annual state income tax return for any fuel taxes paid at the pump (backed up by receipts). None of this is impossible, and it need not be perfect. And it is far better than charging drivers nothing at all for building and maintaining the roads they use. The basic problem comes from not indexing the fuel taxes for inflation. 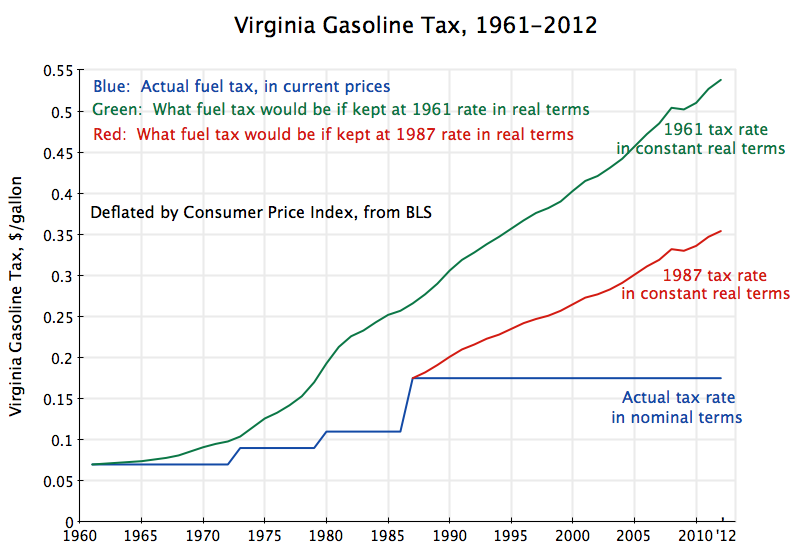 Virginia has imposed fuel taxes since 1923, and they have never, over this period, been as low as they are now in real terms. In terms of today’s prices, they were at their highest in 1933 at what today would be 88 cents per gallon. The nominal price then was 5 cents. And it is absurd to argue that people today cannot afford 88 cents per gallon, when such a rate was possible in 1933 in the middle of the Great Depression. People were far poorer then than they are now. And no one is proposing a return to 88 cents per gallon for the state tax. But it would not be unreasonable to return to the rate Virginia charged in 1961, or at least charged in 1987. The 1961 rate was 7 cents per gallon, and it generated sufficient revenues so that Virginia was widely seen at that time to have had one of the better road systems in the nation. The 7 cents per gallon in 1961 would be a rate of about 54 cents today. See the graph at the top of this post. And again, if we could afford it in 1961 (and afford an even higher rate in real terms in 1933), it is absurd to say we cannot afford it today. The governor’s detailed proposal provides estimates over the five years 2014 to 2018 of what the revenues would be under his proposals. While losing the revenues generated by the fuel tax on gasoline, he would substitute by adding 0.8% points to the current 5.0% Virginia general sales tax, would keep the 17.5 cents tax on diesel fuel, and would take other measures (including shifts of funds out of education, health, and/or public safety; these areas account for 84% of Virginia’s non-transport budget so you would have to cut them; there is nothing else) to increase funds allocated to transportation. Over the five years, funds for transport from the current fuel taxes on gasoline and diesel (if one were to keep them as now) would rise from $4.5 billion to a total of $7.7 billion, or an increase of $3.2 billion. While the $7.7 billion total would be a good deal more than what is currently being funded for transport by the fuel taxes, many note that this would still be too low given the backlog of Virginia’s needs. And in addition to being too low, it would shift the burden away from those who use the roads the most, onto the regressive sales tax which impacts the poor the most. Alternatively, returning the fuel tax rate to what it was in 1987 in real terms, and even more so if it were returned to what it was in 1961 in real terms, would generate far more revenues. Shifting to the 1987 rate and then indexing it for inflation, would generate revenues of $9.9 billion over the five years, an increase of $5.4 billion. The governor is proposing an increase of only $3.2 billion. Shifting to the 1961 rate and then indexing it for inflation, would generate revenues of $14.0 billion. Such funding would permit a much more rapid rehabilitation of Virginia’s road infrastructure, and would be far fairer as those using the roads would pay for them in rough proportion to how much they use them. In conclusion, there is no mystery as to why Virginia has been unable to invest in keeping up what was once a good road network: It has allowed its source of funding for such investments to fall to the lowest it has been since first set in 1923. But it would be straightforward to index the fuel tax to the rate of inflation, with a small annual adjustment which would not lead to this revenue source deteriorating over time. Using fuel taxes to pay for roads is not only fair but is also efficient, as those who use the roads pay for them, and can decide whether and how much to drive based on facing the full cost of what they do. And those that take care in not driving too much, adding to congestion and pollution, will pay more, while those who cannot be bothered will pay less. This entry was posted in Fiscal Issues and tagged infrastructure, tax system, taxes by aneconomicsense. Bookmark the permalink.